There are a number of ways to approach the steep climb up Munra Point. One can either begin at the Wahclella Falls parking lot and hike west along the freeway, or one can start at the Elowah Falls trail head and hike east. 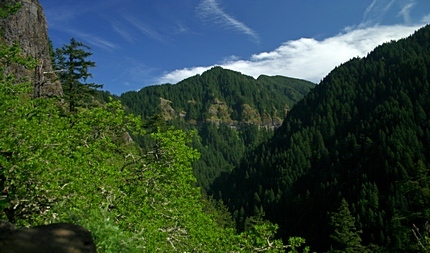 I show the hike from Wahclella Falls TH. The trail from Wahclella Falls trail head is shorter. Some people park along the freeway at the east end of the Moffett Creek bridge, but I would not advise that. However you get to the base of the Munra Point climb, be prepared for one of the steepest climbs anywhere in the gorge. You ascend almost 1700' in just over a mile. In places the trail is barely visible, and you have to climb hand over foot, clinging to branches of nearby trees to make it up some areas of the "trail". The top of the point is very narrow and quite dangerous. THIS IS NOT A HIKE for wet weather. One slip on this hike and you could really be injured. REMEMBER, this is NOT a maintained trail. 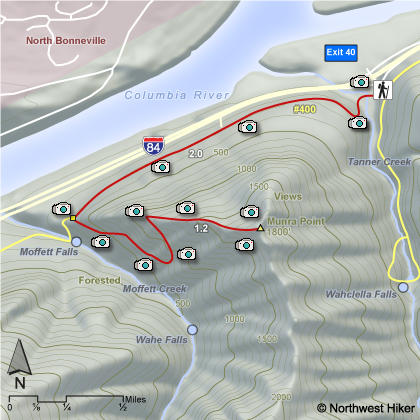 Wahclella Falls/Toothrock Trailhead: From I-84, take Exit #40/Bonneville Dam. Turn south at the stop sign and drive about 100 feet. Stay to the right, taking you to Wahclella Falls trailhead. Left takes you to Toothrock trailhead. Park here then walk back towards the freeway a short distance, and you will see an old roadbed on your left. This is the beginning of the trail to Munra Point. The first part of the hike is actually on the Gorge 400 trail.